ACT’s Executive Director Deb Harford and Senior Advisor and water expert Bob Sandford were panelists at an event on February 16, 2017, focusing on the imperative to renegotiate the Treaty while considering emerging challenges pertaining to ecosystem impacts, sustainability of fish habitats, and changing climate and hydrological patterns. Anthony Cotter, past researcher with ACT, completed his Masters of Public Policy thesis on the application of ecosystem services valuation in the Columbia River basin. In October 2015, ACT in partnership with the Canadian Water Resources Association hosted a one-day workshop on the Columbia River Treaty. ACT also published a report documenting the outcomes of this workshop. ACT published a comprehensive report exploring estimated values of ecosystem goods and services in the Columbia River Basin. Deborah Harford, executive director of ACT, discussed the upcoming opportunity to renegotiate the Columbia River Treaty in 2024 — one of the largest international trans-boundary water treaties in the world — coupled with a changing climate. ACT’s first book, published in November 2014, is a vital work that clearly explains the nature of this complex water agreement between Canada and the United States and how its impending update will impact communities, landscapes, industry and water supplies between the two countries for many years to come. 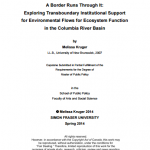 Melissa Kruger, past ACT researcher, completed her Masters of Public Policy thesis on the Columbia River Treaty, exploring the role of institutional cooperation between the United States and Canada in supporting flow regimes that sustain the health and function of the ecosystem. 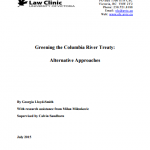 This paper explores options for transboundary initiatives in the Columbia River Basin. First, it presents key background information to the Columbia River Treaty, relevant transboundary governance principles, and existing work in this field. Next, it explores the institutional structure of a Columbia River Basin transboundary governance body. Finally, it touches upon the potential for informal Track II diplomatic initiatives in the Columbia River Basin.